The hidden cost in owning a clean diesel Mercedes? Filling it up with AdBlue urea solution at an outrageous price of $32.20-per-gallon. Consumer Reports felt the pain after receiving this $294 bill for a top-off in their diesel Mercedes GL350. 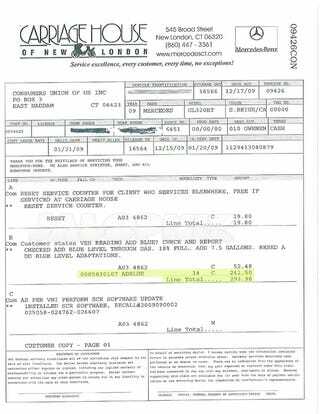 A copy of the bill shows the vehicle's AdBlue tank was given an additional 7.5 gallons of the fluid at a price of $241.50 (or about $32.20 per gallon) with an installation charge of $52.48 for the full $293.98 price. Considering the mileage on the vehicle was about 16,565 miles it's a decent amount of money to spend approximately once a year on top of other expenses. Why do Mercedes diesel owners have to do this? Diesel vehicles typically get higher mileage than their gas-powered counterparts, but the increased emission of nitrogen oxide (NOx) from diesel engines makes them an environmental threat. In order to limit the NOx levels coming out of the tailpipe, the Mercedes BlueTec system injects a urea solution into the exhaust, which turns most of the NOx into water and nitrogen. The urea used is not actual urine from an animal, but a synthetic solution mixed with water called AdBlue. It's no secret dealers often charge more for the same service, but the amount of money being charged for AdBlue at Mercedes service centers (not just this one) breaks down to about $32.20 per gallon as mentioned compared to approximately $6.75 per gallon for the Audi/VW variety at WorldImpex.com, which a poster at the BenzWorld forum claims will work for his ML Mercedes. Even if you can get the solution itself at a lower cost, installing it yourself is a risky proposition because a mistake could mean damaging a catalytic converter — one of the most expensive parts on a car. And it's not like you can just ignore refilling this as most AdBlue vehicles will slow you down or stop running altogether if you don't. Overall, this means you're basically stuck going to Mercedes to get your car serviced and, as Consumer Reports' bill shows, paying $20 to get the oil change light reset. BMW, which also uses the system, doesn't charge for AdBlue for the first 50K miles if you have their free maintenance plan.